Bharti Airtel bitten by the conglomerization bug - 9 new verticals ! Conglomerization is nothing new to India. Almost all the business houses are obsessed with spinning off separate business units. Sometimes in related fields and sometimes in totally unrelated fields. It is so prevalent that even Infosys couldn’t resist having its own spin-off of OnMobile. Now, it is time for Bharti to have its own little conglomerate. Most of them in the related space of technology and few in spaces like retail. Bharti Airtel has 3 verticals Mobility, Telemedia and Enterprise. This will be split into 9 different verticals with 9 CEO’s. Too many CEO’s right? Seriously? Is that why we re-structure a business? If that is the only logic or even the main logic, Airtel has a serious problem. The problem is more to do with talent retention rather than anything else. I just hope that is not the reason for Bharthi’s restructuring. Getting back to the re-org, there is a thin line between Media and Entertainment. I really don’t see the need for 2 separate units. I have my reservations about Internet but that can be a separate unit. Mobile commerce is ready to explode and Bharti might just have positioned itself really well to cash in on this. What are those 9 verticals? This is what the new organization might look like. This is just a speculation based on the information available. It would be interesting to see what Bharti would do next. Would it list its mobile commerce unit separately? This is actually an anit-climax of what other conglomerates are thinking of. Reliance Industries just took RPL under its wings. Many other conglomerates who expanded like hell are also thinking of doing the same thing. Why exactly is Bharti going the other way? 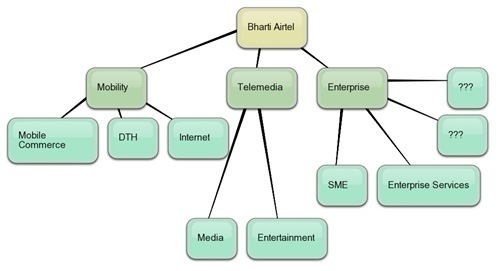 What do you think of the new re-org of Bharti Airtel? Is this true that every starting telecoms company in India, first signs a contract deal with airtel? Re-Org will help, but 9 verticals and 9 CEO’s is too much. I agree with @Yash. But, one of the business units can pull the company and the stock down if not listed seperately. Do you see what’s happening with GE? The investors really cannot seperate which is which and dump the whole stock if one of the units is affected. Talent retention might be one of the factors behind this restructuring, but the larger picture seems to be that of growth. Bharti has ventured into a lot of diverse areas off late. Mobile, Retail, DTH, broadband, are very diverse businesses. Although technologically some of them might look connected like mobile and broadband but they are still very different with different target markets and different set of competitors. By giving each line of business its separate identity what Bharti is doing is it is giving each unit ample room to grow in its respective field of business. If you already have a pool of talented managers then there’s no harm in giving them charge of growing a line of business. CEO of each BU can then concentrate solely on his/her line of business which is better than a centralized managing committee running all of them. Its like patriarch of a joint family allowing members of the family to go on their own and flourish as per their abilities. Spinning off various units is a great strategy, and when it works, it works wonders. I can’t help but think of a better example of this de-integration strategy than IPL – the Indian premier league. One of the reasons why IPL was a huge success and ICL was not even after being pioneer of league cricket in India – is that IPL went the franchise way – each team was handed over to a separate group who invested time and money to market their team and build a fan base. ICL on the other hand marketed entire event as one. Zee marketed all the teams all by itself. Zee’s resources got spread over all the teams and no single team was able to create its separate identity. On the other hand IPL team owners put all their energies in promoting just one team, and it resulted in stupendous success. That’s how other conglomerates like GE and Tata have thrived. You give each unit a separate identity then you are opening doors to a lot of opportunities, you can raise money for them separately. If one unit is losing money, it doesn’t drag the group’s balance sheet along with it. Unlike Google one successful unit doesn’t feed the slackers. And it definitely boosts moral of the talented managers. They are getting their own show to run after all!